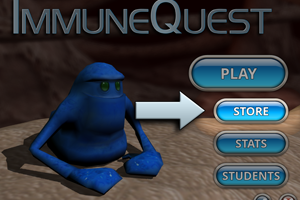 ImmuneQuest is an innovative educational game for college students that brings immunology to life. 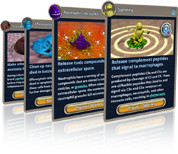 Designed to augment an educator’s existing curriculum, ImmuneQuest allows students to build and control a virtual immune system to defend their human host from increasingly cunning microbes. Why we created ImmuneQuest. How is mastery of the immunobiology concepts measured? This material is based upon work supported by the National Science Foundation under grant number 1058156. Any opinions, findings, and conclusions or recommendations expressed in this work are those of the author(s) and do not necessarily reflect the views of the National Science Foundation. 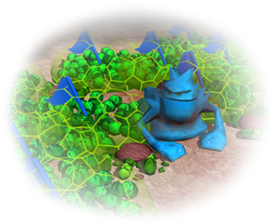 ImmuneQuest divides the virtual immune system into five major parts. Each part builds on the player's previous experience across a series of 3 interactive levels, plus 3 optional, bonus levels where the cumulative lessons learned are subjected to new and unique challenges. Every level unlocks more immune system upgrades and new immune cells to help the player overcome increasingly sophisticated and stealthy microbial threats. 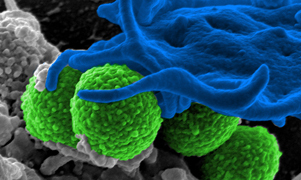 Begin with the most ancient evolutionary components of the innate immune system – macrophages and complement – the first to encounter microbes in the host tissues. First responders are overrun. Signal for cellular reinforcements from the blood. Unlock voracious neutrophils and experience first-hand how these innate immune components work synergistically. 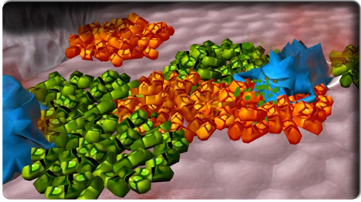 These parts focus on immune defenses against viruses and building the adaptive immune system. By the end of Part 5, one will have mastered how all eight immune components work as an interconnected whole to defend host tissues! Your purchase of Part 2 will help fund the development of Parts 3-5! ImmuneQuest is designed to augment college curricula in biology, immunology, bioengineering, nursing, medicine, and healthcare. ImmuneQuest can also provide an immunology component for institutions that do not retain faculty members with immunology expertise, and can be added to AP high school biology programs to further inspire students to enter the life sciences. ImmuneQuest measures student performance against learning objectives and provides those metrics to students –compared with their peers. We have also created a free tool for educators to observe student progress within the program and foster competition among students. Our ultimate goal is to inspire more students to be drawn to immunology and become our future leaders in life science and medicine. As one of the most complex, daunting, yet rewarding areas of study in the life sciences, immunology is critical not only for advancing the study of infectious disease, but also autoimmune diseases (multiple sclerosis, rheumatoid arthritis, psoriasis, Crohn’s arthritis, lupus), cancer, asthma, and many others. Current approaches struggle to illustrate the systemic nature of immune responses. Educators from high school to medical school all described a pressing need to enable students to move beyond the nomenclature and the detailed nature of textbooks to grasp the immune system as an interconnected whole. Therefore, our approach is to maintain focus on the immune system as a living and responsive mechanism, and to explore how various components of this system interact and affect the entire system in the presence of external or internal variables. To bring this vision to reality, our PhD scientists and technologists – with significant support from the National Science Foundation – combined advanced game technology, systems-engineering, and modern learning methodologies. Register your Class: Click this link to register your course with ImmuneQuest. Register as many courses/classes as you want. Students register by opening ImmuneQuest and clicking “Student”. They will enter your code, their name, and confirm to join the class. Open ImmuneQuest, click “Student”, click “Review Class Stats”, and select the class you want to view.